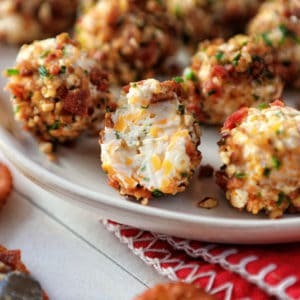 Seriously flavorful bite-sized cheese balls make the best appetizer! Mix together cream cheese, cheddar, and ranch package. Form into 16 small balls (about 1/2 inch) and refrigerate until firm, about 1 hour. In a small bowl or on a plate, stir together cooked bacon, chives, and pecans. Roll balls in bacon-chive-pecan mixture. Serve. If not immediately serving, loosely cover with plastic wrap and put in the refrigerator. Let sit at room temperature for 15 minutes before serving.